I suppose I should write about the election. I’m over it, and in any event, I’ve already voted. The shame of it all, at least for me, is that thanks to this dirty election, I’m questioning everything every candidate says. The truth is that we don’t know what the truth is. I helped a 93 year old lady vote while I was at the early polling place. She managed to scribble in the oval for Obama. Beyond that, she knew none of the candidates and none of the issues. I suspect she was picking all of the Jewish sounding last names. The reason I helped her is she was in the next booth calling for help. I asked for assistance for her, but no one came. Finally, not wanting to just leave her standing there, I offered to help. In the course of reading her the ballot, she told me she was legally blind. It is what it is. At least she voted. I’d rather tell everyone about Roxy, my grand puppy girl. It’s no secret I want a grandchild. It’s also no secret that I’ll not be getting one in the near or perhaps even distant future. 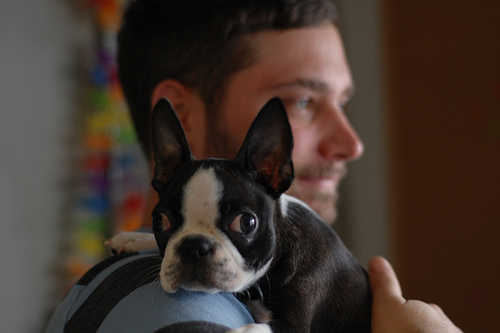 But Benjamin now has a 3 1/2 month old Boston Terrier named Roxy. She is sweet, energetic, and lovable, and she likes her human grandma. The issue is that my King Charles Cavalier Spaniels, Rex and Max, don’t like her at all. Pure jealousy, I suspect. Max has finally quit trying to eat her and is just rude when she’s around. Rex, my sweetie dog, on the other hand, offered to rip Roxy a new one. The little girl had the good sense to run, and Rex was polite enough to let it go with a verbal warning. I’m proud of how well Benjamin is caring for her. She is almost housebroken, is healthy, and he’s already discussed having her spayed with the vet. Great Choice on the picture!!!!!!!!!!!!! !